Moisture-displacing formula neutralizes the corrosive action of water, sweat, and fingerprints to provide long-lasting protection against rust. Metal treated with Barricade withstood 500 hours in a high-humidity test environment and resisted corrosion for 96 hours in continuous salt water spray tests. Dries to a thin, non-gumming film. Excellent penetrant for loosening rusted parts. Harmless to wood, leather and non-ferrous metals. 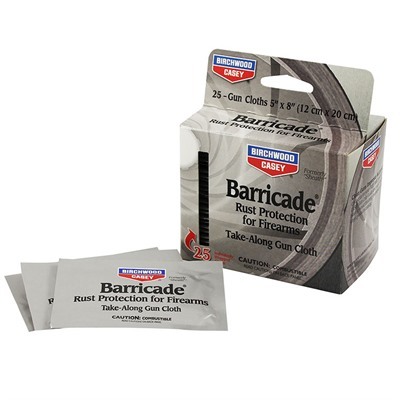 Available as a liquid or aerosol, or in a 25-pak of individually wrapped, pre-soaked Take-Along Gun Cloths for on-the-go, anywhere cleaning. Formerly called Sheath. Mfg: Birchwood Casey SPECS: 4 1/2 fl oz. (133 ml) can w/spout cap, 6 oz. (170 g) aerosol, or box of 25 individually wrapped pre-soaked cloths, approximately 8" (20.3cm) x 5" (12.7cm).